Education has always been a core value for us at QuantConnect — with all of the intelligent and talented people in our quant community, there is great opportunity to learn from each other as both the platform and user base grow. 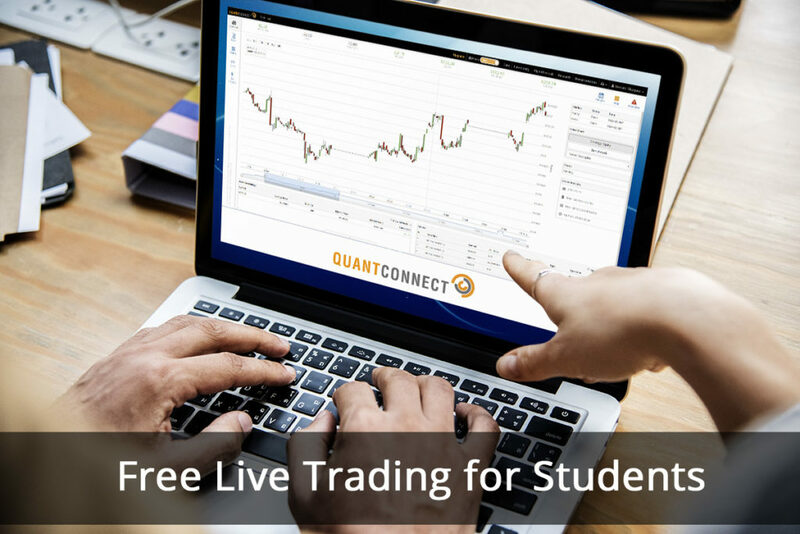 Today, we’re excited to announce QuantConnect Live Trading is now free for students. All you need to do is simply register with your .edu email address, and you can start trading at no cost. We decided to make Live Trading free for all students to continue breaking down the barriers for talented quant finance students, engineers, data scientists and coders to develop their algorithmic trading skills. We already have more than 1,200 students across the globe who use QuantConnect, and we’re looking forward to growing that number as we foster the largest community of independent algorithmic traders in the world. In addition to the students who independently use QuantConnect to backtest and deploy their algorithmic trading strategies, we also have a number of universities who are using LEAN to supplement their curricula. One example is at the University of Washington’s Master of Science in Computational Finance and Risk Management (CFRM) Program. Tim Leung, Associate Professor and Director of the CFRM Program, uses our platform to introduce his students to quantitative trading techniques in his course. “QuantConnect enables our students to develop, evaluate and apply trading strategies through a live or paper trading account for use with a brokerage, and to access QuantConnect’s real-time market data,” said Leung. For those who are just getting started with programming, we offer our own “Boot Camp,” an interactive mission-based tutorial system that we launched a little over a year ago. Our community can leverage the Boot Camp to learn the basics of algorithmic trading on the platform using US Equities and FOREX, as well as common indicators and how to import custom data for your strategies. So far, over 10,000 participants have completed the Boot Camp and joined our community of quants. Live trading has been supported through QuantConnect since 2015, serving thousands of quants through modern, colocated servers. Our goal is to provide a consistent environment between backtesting and live trading, minimizing any differences between the two to ensure for a seamless transition. QuantConnect users can trade a variety of asset classes through different brokerages, including FXCM (FOREX, CFD), Interactive Brokers (Equity, FOREX, Futures, Options), OANDA (FOREX, CFD), and Coinbase Pro (Cryptocurrency). If you’d like more information on our live trading offering, please see our Live Trading Overview page. Happy trading!